I found Murli Gurjar sitting on a stone slab at the corner of a by-lane on Amer road chatting with a fellow man and smoking a bidi. He was not in a mood to chat. When I asked him if I can click his picture, he shied away and refused. I moved on. 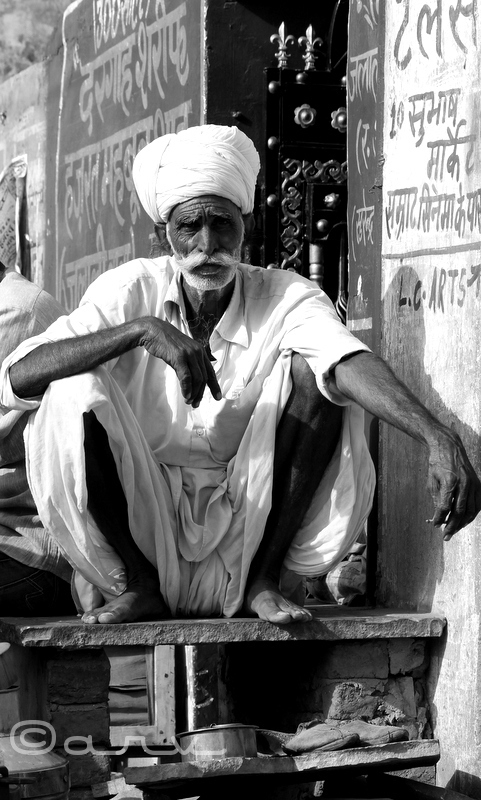 After a few minutes, when I was passing by him again, the man sitting next to him prodded him to get clicked. In a joking mood, he pushed Murli Gurjar for a picture pointing out that I was from a local newspaper. He made a facial expression which meant he was out to pull a joke on Murli Gurjar (and that I should be party to it too!). This somehow excited Murli Gurjar and he started posing for a picture. I was quite surprised to see such a drastic change in his behavior. Since I did not want to lose such an opportunity, I quickly clicked a picture. After which, I showed him his picture on the screen of my camera, which he approved with a smile. Rural folks really know how to entertain each other. Despite the fact that they are simple, they are always ready to pull a joke on each other. Pingback: 2015/Reflactions-Favorite Images from 2015 | Jaipur thru my lens !! Pingback: Doodh Mandi – Milk Market of Jaipur ! – Jaipur thru my lens !! Previous Previous post: Pigeons….Friends !